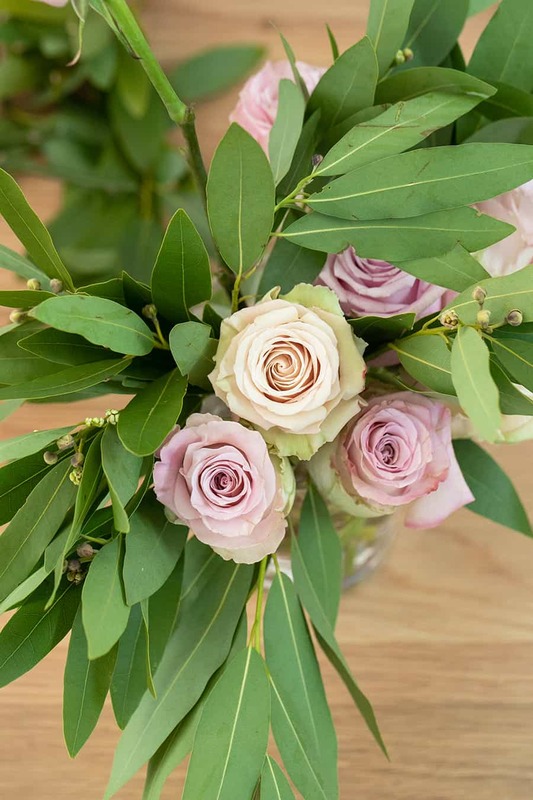 Arranging roses can be a daunting task, so we asked floral expert Erin from White Fig Designs to share her tips! 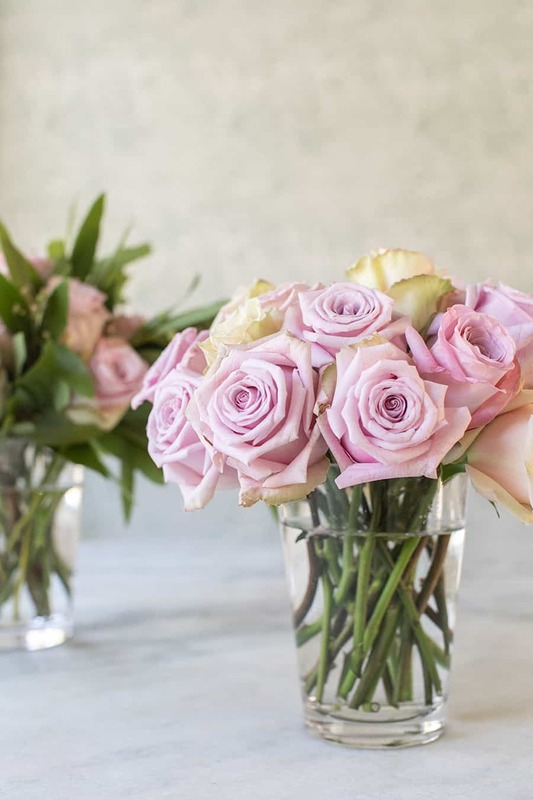 She’s sharing two beautiful ways to arrange roses in a vase. Before you start arranging roses, you need to do a little prep work. Right when you get home from buying your roses, just give the bottoms a 45 degree angle trim, while they’re still wrapped and set them in water. No need to de-wrap or de-leaf yet, you’ll want the stem to soak up the water for about 30 minutes to an hour. After they have soaked, you can remove them from the water and grocery store wrapping and start to remove their leaves and thorns. Make sure to cut the stem on an angle. This allows for a greater surface area and increases water intake. To open the roses, give them a little spin! Erin tips them upside down and twirls them, this allows the air to flow through and opens the blooms. Quick tip, do not touch the rose heads with your fingers. 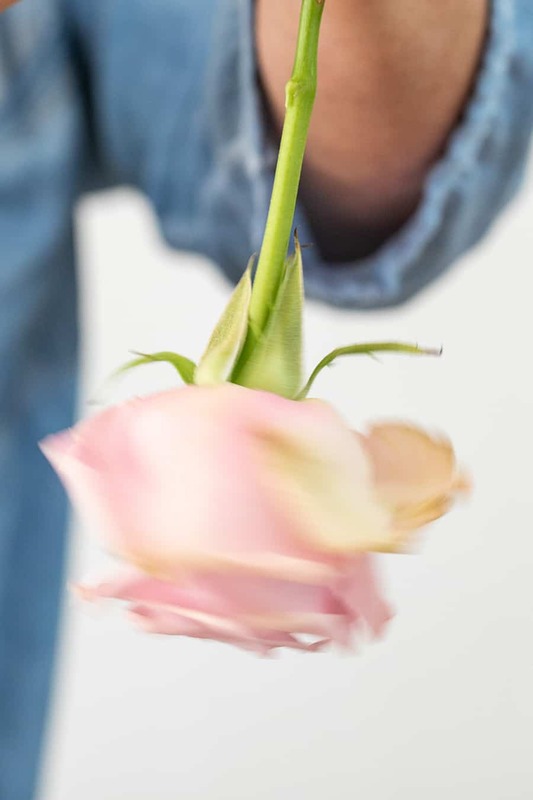 The oils and water from your hands will create moldy rose blooms and they won’t last as long. The first way to arrange grocery store roses is the European Hand Tie. Lay two dozen, prepped roses out to start. Then with one rose as your center, add the second one on an angle next to it, crossing the stems. You want the stem to be opposite of the other rose so the rose stems start to create a sprawling out look. Continue doing this in a circle, laying the roses an an angle next to each other, with the stems sprawling out. 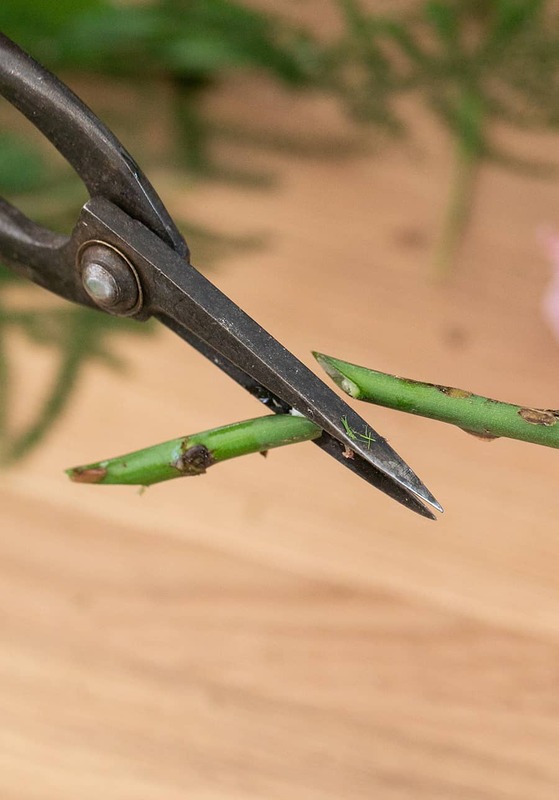 Once you have reached the desired size or used all of your roses, you can hand tie them with a twine at the base, or measure the stems against the vase you’ll be using and cut off the extra stems. 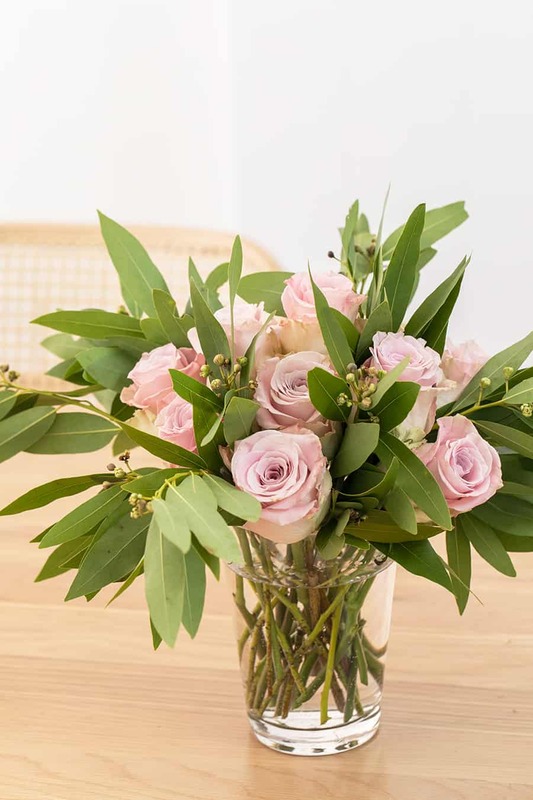 You want the rose heads to be just above the top of the vase, so hold it near the vase and cut the extra stems. You will get this tight rose look which is very beautiful! This arrangement doesn’t need any greens, it’s just beautiful on it’s own. The second way to arrange roses in a vase is the grid way. 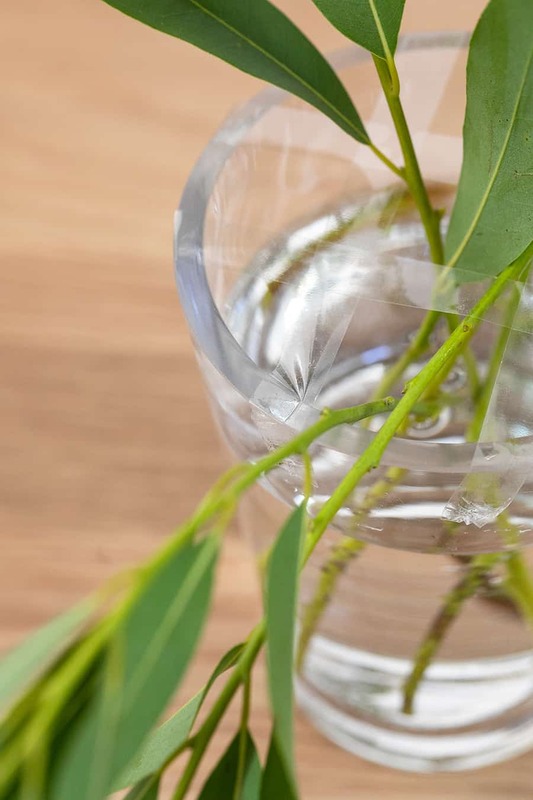 Start by using regular tape and tape a grid across the top of your vase. The grid gives you freedom to place the roses where you want and gives the flower stability. 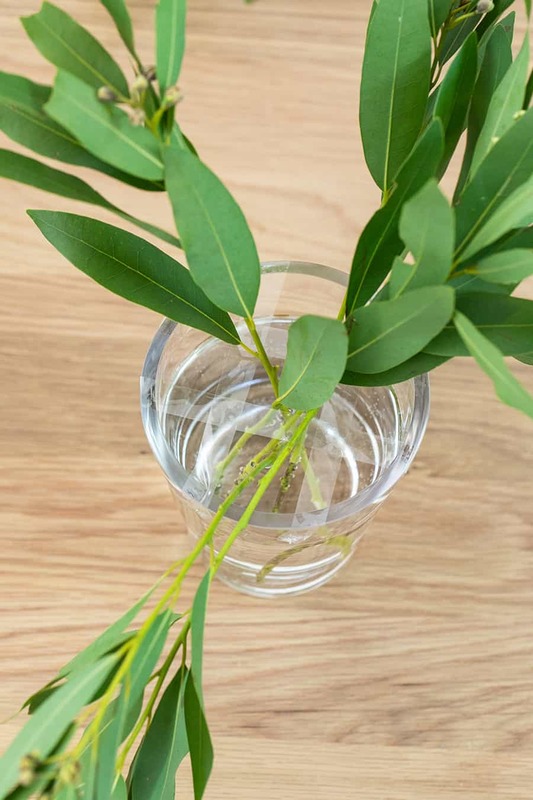 For this arrangement you’ll want to add in some greenery, we used bay leaves. You’ll want to add in a few pieces of greenery facing one way and a few facing the other way. Then start to add in the flowers. Measure the rose against the vase first, then make the 45 degree angle cut. Start to place them around, then add more greenery until you’re happy with the finished result! 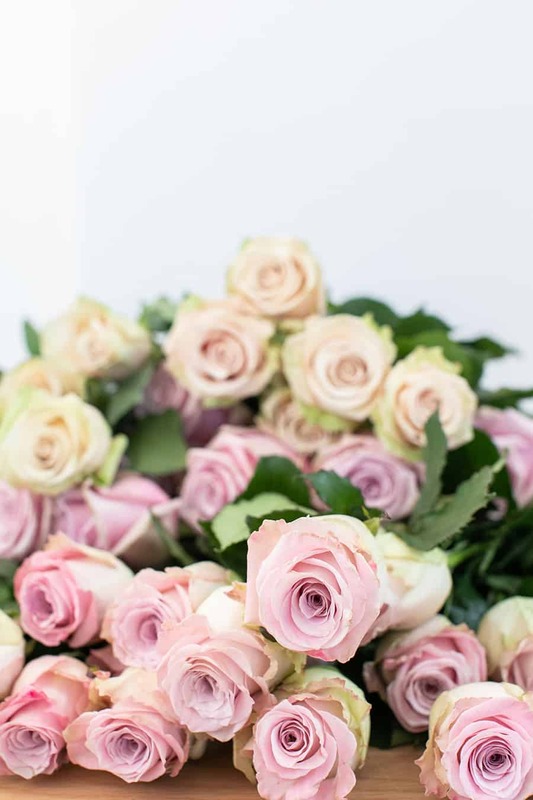 How tall should roses be in a vase? 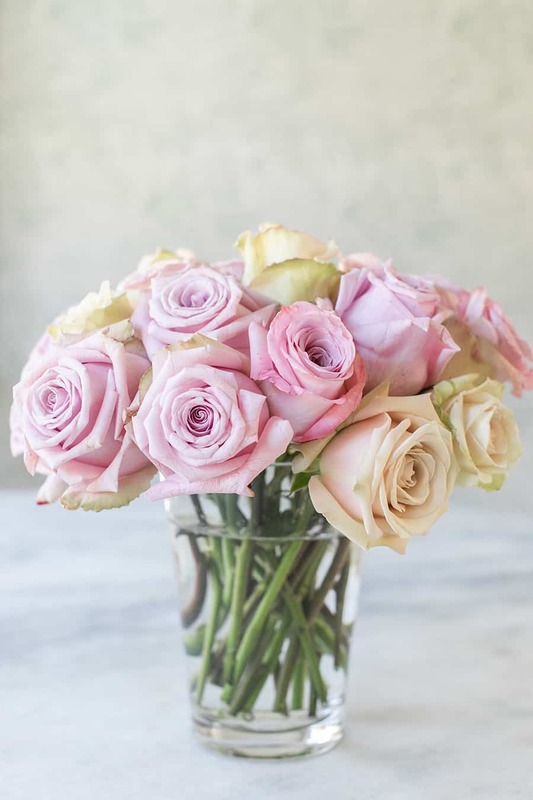 This is truly personal preference, but we like when the rose head sits just above the top of the vase. You can hold them up against the vase to measure before you cut. 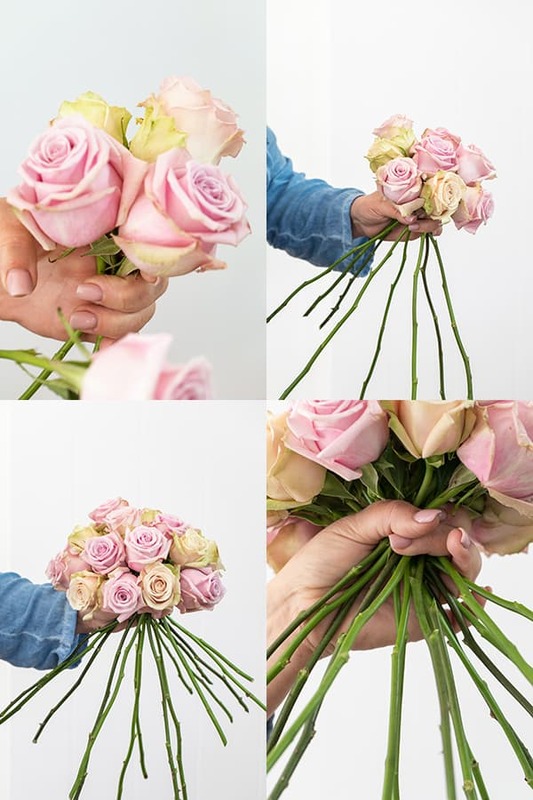 Hope you learned a few tips for arranging roses! 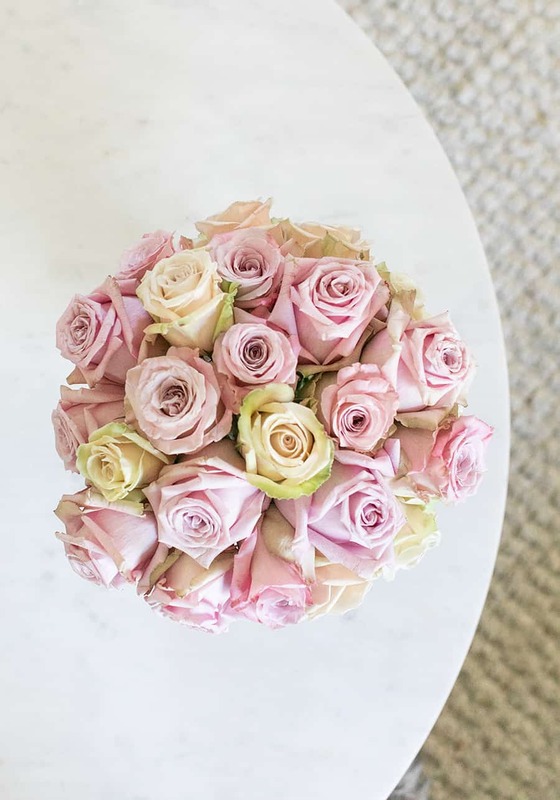 If you love flowers as much as I do, check out these 10 Floral Arranging Tips from a Pro and 7 Tips for Creating DIY Wedding Flowers on a Budget. A Charming way to keep bugs away… Bug Repellent Potpourri!